Picenum was a region of ancient Italy. 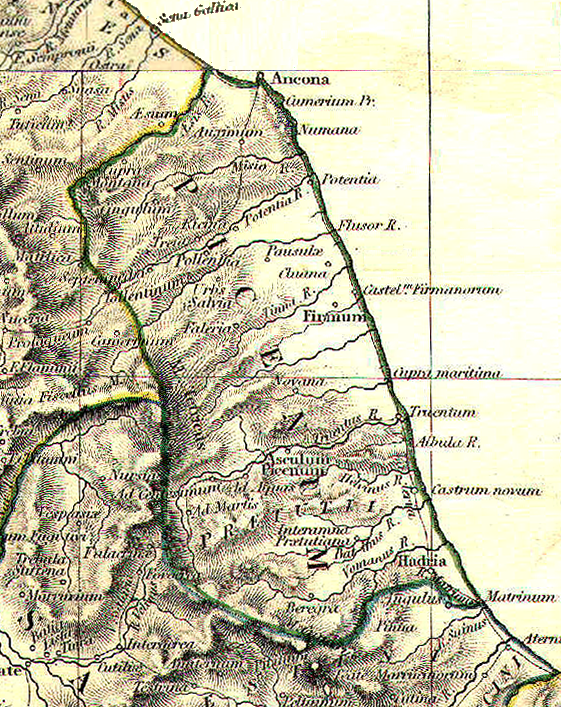 It was situated in what is now Marche and the northern part of Abruzzo. The Piceni or Picentes were the native population of Picenum, but they were not of uniform ethnicity. Strabo includes the following cities in Picenum, from north to south: Ancona, Auxumum, Septempeda, Pneuentia, Potentia, Firmum Picenum with port at Castellum, Cupra Maritima, Truentum on the Truentinus and finally Castrum Novum and Matrinum on the Matrinus,south of Silvi in Abruzzo. He also mentions Adria and Asculum Picenum in the interior.